Argument — much like karaoke and online shopping — is at its best when done with friends and a drink. And so, here’s “Bar Fights With Walt,” a column devoted to solving the only questions that truly matter: the dumb arguments about life and pop culture developed and hashed out in barroom rants. We’ll use data and research to take these arguments to their logical statistical conclusion. If you’d like to submit a question or conundrum, corner the author at one of his typical haunts and pick a fight. 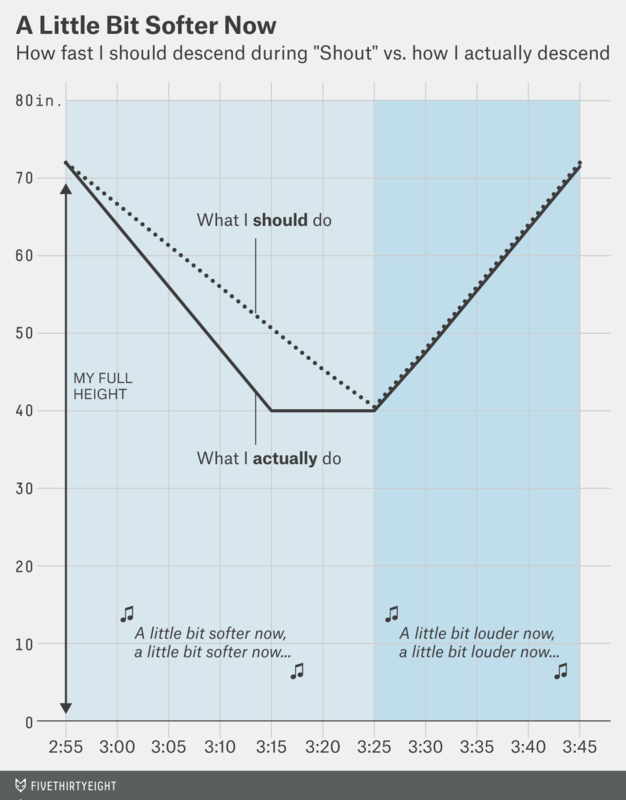 In case you’re unfamiliar, dancing to “Shout” is basically the easiest thing in the world. I don’t have a head for anything much more complicated than orchestrated flailing — “Cha Cha Slide” is my cue to hit the bar — so “Shout” is a musical oasis because it involves putting your hands up and jumping when you hear the word “shout,” and that’s about it. Except there’s a part when the song implores dancers to — wait a minute — take it easy, and then slowly descend to essentially a squat. Anyway, I’m terrible at timing that. I always end up way too low way too early. It’s a problem. I either have to just sit there until the section is over or say “screw it” and basically get on the floor. So, I wanted to figure out a rule of thumb for descending during the “a little bit softer now.” This meant figuring out the average distance between someone’s starting height and her finishing height, and spacing out the difference evenly over the “a little bit softer now” section. This involved walking around the office with a tape measure and bugging colleagues. Plugging this metric in for the 15 guinea pigs colleagues and roommates who participated in this experiment, the average difference between their ideal end point and the predicted end point was 2.4 inches, which wasn’t that bad. If you’re a flexible person, descend a little faster. If you’re less flexible, descend slower. Because nobody wants to be this guy on the floor.